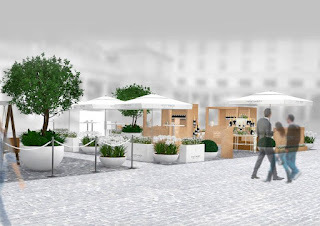 Another great open air summer pop-up: English sparkling wine producer Nyetimber is opening a pop-up wine bar in Covent Garden Piazza, to be open from 1st - 28th June 2017 from 1pm - 8pm. The space has been created by designer Lee Bestall, themed around 500 Years of Covent Garden, and there will also be special events including a brunch from nearby restaurant Balthazar. "For over 25 years Nyetimber has had a single aim: to make the finest English sparkling wine, one to rival the very best in the world. A true pioneer, Nyetimber was the first producer of English sparkling wine to exclusively grow the three celebrated grape varieties: Pinot Noir, Pinot Meunier and Chardonnay. Crafted in the traditional method from one hundred percent estate-grown grapes, Nyetimber is one of the most award-winning sparkling wines in the world. If you’re looking to soak up the sunshine and savour a glass of England’s finest sparkling wine, The Nyetimber Garden Bar situated in The Terrace at Covent Garden, is the place to relax and enjoy the Great British summer. Immerse yourself in an urban oasis showcasing planting from the ‘500 Years of Covent Garden’ Show Garden created for the 2017 RHS Chelsea Flower Show by designer Lee Bestall. Hosting a series of pop-up culinary collaborations including the world-famous Balthazar brunch and afternoon tea; dinners with Britain’s top chefs and pre-theatre bites by Aubaine, The Nyetimber Garden Bar offers something special for city explorers."